DXF Export - I want 0-width Lines and Arcs only. How do I accomplish this? See my output in the software window is different and when I tried to export the file to DXF the outline of PCB is coming in two lines, why its like that. I have only one line in the outline of PCB. See the attached files to see my software and exported DXF file output. Can you please tell me what I am doing wrong. Thanks for your question. Everyone has different requirements for how they want there DXF files created, and you will notice during DXF export there are several "options" which will affect how objects are outputted. 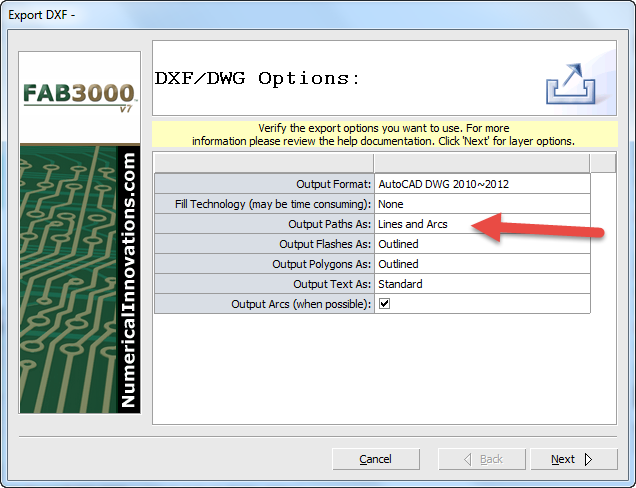 By default the DXF paths are generated with "outline" (i.e. the outline around the true size of traces). If you just want single 0-width lines, than select Outputs Paths as "Lines and Arcs".